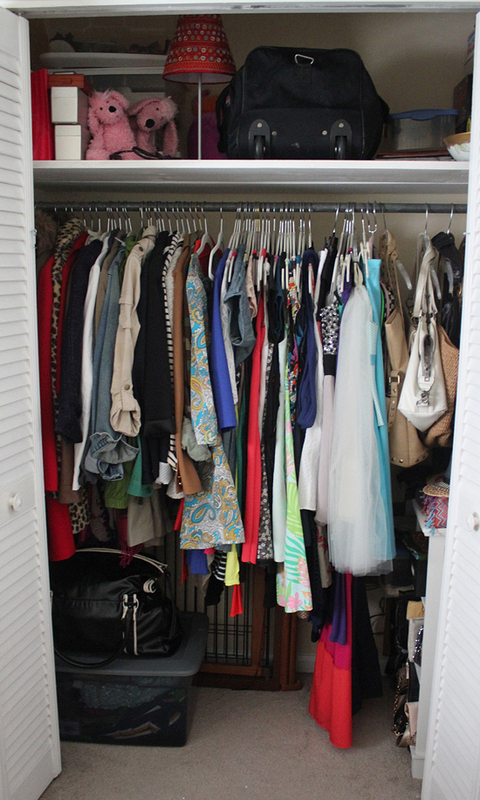 Over the past couple of months we have been talking about curating the closet of your dreams. So far the "Curated Closet" series has covered identifying the problem, filling wardrobe holes, adding wardrobe completers & closet organization. The last time I gave a tour of my closet was December 2011 & I think we are due for another round! Two closets span one wall in my room & I have to say, I have utilized every inch of this hard to come by storage. 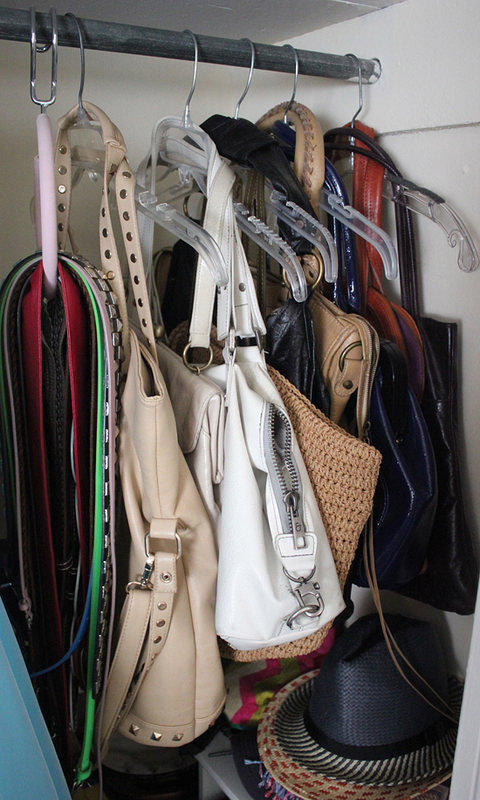 In the left hand side closet I hang (from Left to Right): coats, jackets, dresses, long skirts & then large handbags. In the right hand side closet I hang (from Left to Right): cardigans, button downs, blouses, short skirts & then trousers & denim. Up top lives special occasion shoes, large sunhats & out of season clothes in vacuum storage bags. Uniform skinny hangers make it feel so luxe in my closet! 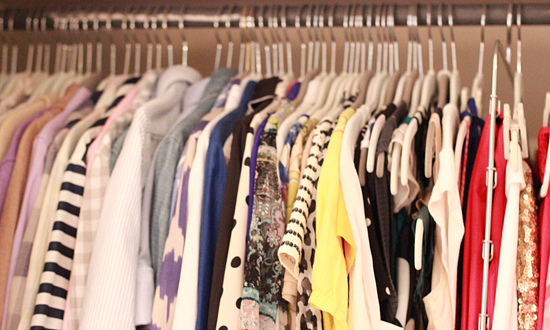 My tips for making the most of your closet space? So you can see, skinny & uniform hangers save space & make me feel like I am shopping at a boutique in my own closet. Alternating the way my shoes point lets me add more to my collection. Maximizing the number of items I can fit on a hanger means I can use less hangers. What state is your closet it? Boutique curated? Or heaping mess? Any winning tips you can share? I love closet tours! Thanks so much for sharing! 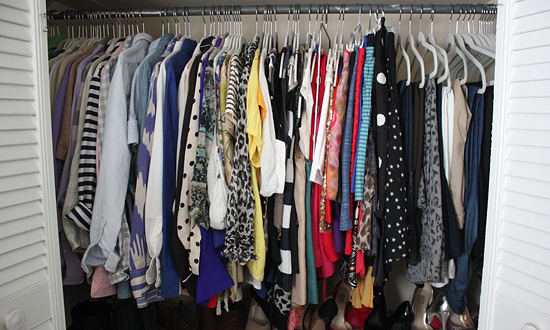 Whoa your closet is amazing and so organized too! Wish mine was like that! 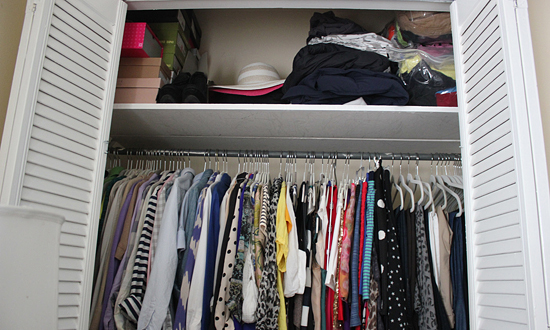 These are great tips–and you're so lucky you have so much closet space! I WISH I had more room! wow! you have a ton of clothes! 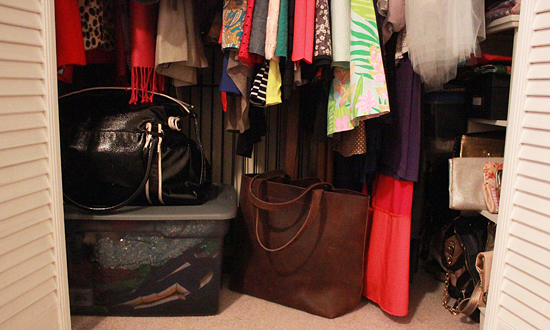 Thanks for sharing your closet Jessica... mine is a mess but I love living vicariously organized through you! Lastly....Doug & Scout are KILLING me in your shoe pic! I have a small closet, so I love seeing closets of similar size so organized! Great tips! Thanks for sharing. Great organizational skills! I like looking at closets. And I like that yours doesn't look TOO perfect and make me feel bad about myself. This is genius! You are inspiring my closet re-organization! The dog picture is too precious! Thanks for sharing, I love seeing how others organize! I have a few of those hangers and they are great for sweaters so you don't get pointy shoulders. I really should transition my whole closet to those hangers. And I'm glad I'm not the only one that pairs like items on one hanger. 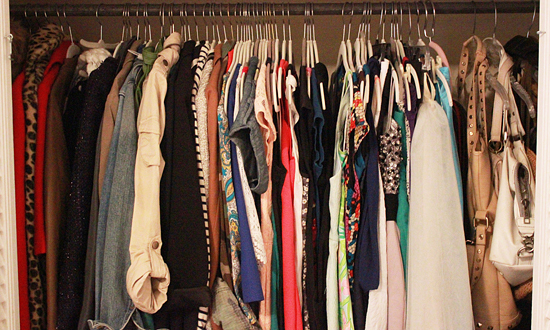 I own about 5 basic black layering tank tops and they are all on one hanger to save space! Love this!! I'm really organized so I have a specific spot for everything, too, but my closet right now can barely be described as a closet. Some genius basically installed a gigantic white box/ledge that takes up the bottom 3 feet of my closet, and I can't use it for anything! So annoying. My #1 priority are nice hangers so I'm totally on board with you! I love this belt hanger: http://www.amazon.com/Vinyl-Dipped-Hangers-Belt-Hanger/dp/B003DL5S82/ref=sr_1_3?ie=UTF8&qid=1378959012&sr=8-3&keywords=belt+hanger Frank uses it for his belts & it's super easy to get a belt off the ring when you need it without having to take them all off or go digging for one. Just turn the ring to the right belt, pull open the 2 rubber parts, and you got your belt! :) I also love those slim hangers & using a 5 tiered hanger for slacks: http://www.amazon.com/Organize-It-All-5-Tier-1302W-6/dp/B000IF8O1O/ref=sr_1_4?ie=UTF8&qid=1378959171&sr=8-4&keywords=5+tiered+hanger i <3 organizing! I love this belt hanger: http://www.amazon.com/Vinyl-Dipped-Hangers-Belt-Hanger/dp/B003DL5S82/ref=sr_1_3?ie=UTF8&qid=1378959012&sr=8-3&keywords=belt+hanger Frank uses it for all of his belts & it's super easy to get just one belt and not take them all off or dig through them. I also love the slim hangers & we use a 5 tiered hanger for his slacks: http://www.amazon.com/Organize-It-All-5-Tier-1302W-6/dp/B000IF8O1O/ref=sr_1_4?ie=UTF8&qid=1378959171&sr=8-4&keywords=5+tiered+hanger I totally did the shoe thing like you before & it's awesome, but my current shoe rack doesn't allow me to do that now... Have you ever used boot shapers or hangers? I wanted to buy some, but then I just hung up my boots with a skirt/pants clip hanger and it worked--the boots aren't super heavy though. I even bought plastic dividers for my undergarments, which are actually awesome! i <3 organizing! I suspected that was a Target purchase but wasn't sure. Thanks for the tip! 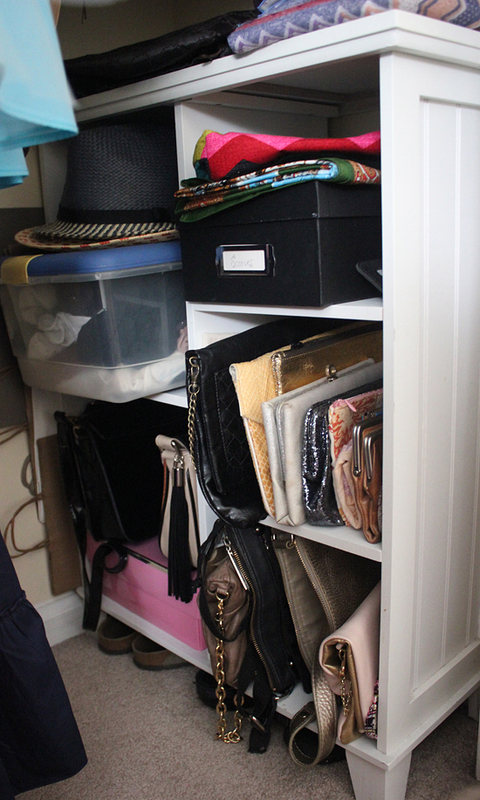 I love seeing inside people's closets! Thanks for sharing! You are very welcome. Thanks for stopping by! Thanks lady! I am a little particular when it comes to my closet, but it saves me so much time in the mornings & I feel good taking care of clothes that I spent a little more on & know will serve me for years to come! I really did luck out on this space - nowhere to put the pots & pans, but my shoes have room to breathe... win some, loose some! Oh bummer! Things to look forward to? And yes, it really should be a crime for a house builder to put in a tiny closet! Um yea, I haven't really thrown anything away since high school... I feel a big purge coming soon! The huggable hangers are definitely more expensive than wire or plastic hangers, but so worth it. Over the course of a year, every time that I went into Target I picked up a pack of hangers, and then before I knew it, my closet was filled! It also helped me toss some older pieces that I didn't think were "worthy" of the special hangers! I wish! I think I missed my calling in life as a closet organizer! Thanks lady - they are a mess! Haha, this is real life people! 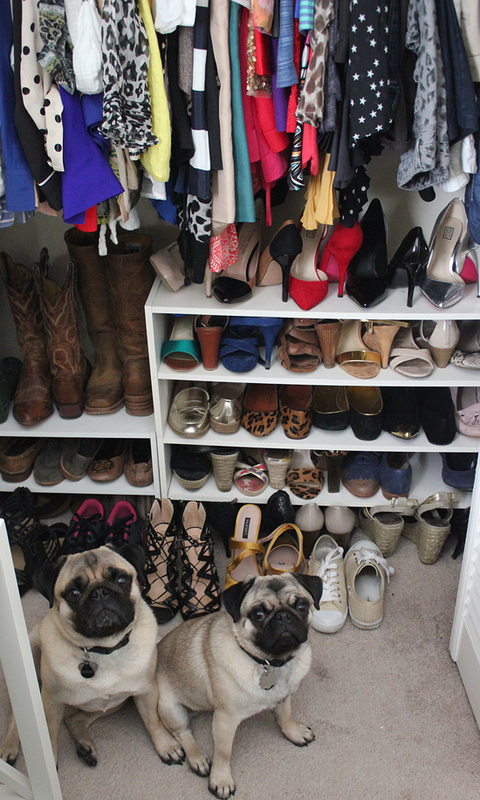 I do what a can, and more times than I care to admit there is a pile of clothes sitting in front of the closet... which is where the pugs LOVE to lie! Um, a closet big enough to hold an ottoman... that sounds so luxurious! 4:45 am... not so much! Every time I go into Target I pick up a pack of huggable hangers, and then only the special pieces get to go on the fancy hangers... a great way to make more space with the hangers and by tossing old items in the process! Ugh, so sorry lady! It really should be a contractor violation to make a small/non-functional closet! You are my favorite little organizer! 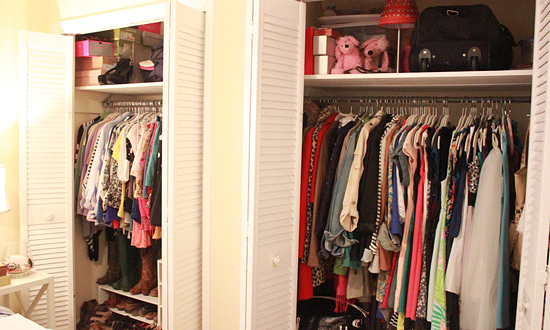 I'm so jealous of all of your closet space! I'm about to move into a new place and first goal is to make sure my closet starts out organized -- the slim hangers are key! By the way, I have to ask, what is with the two pink poodles on your top shelf? ?